The Transcribe! 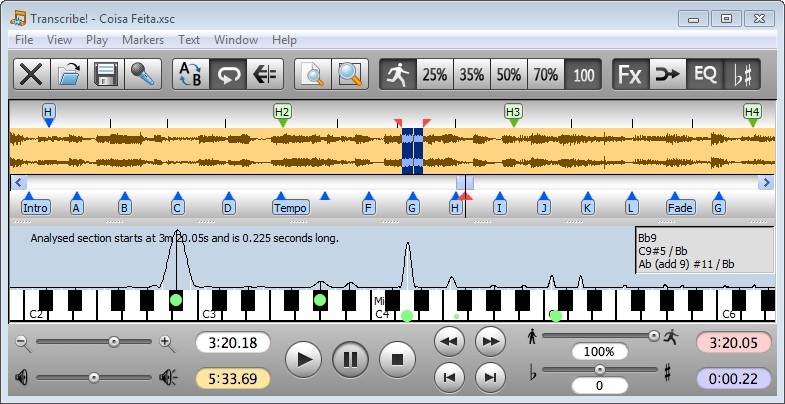 application is an assistant for working out a piece of music from a recording. The usual technique is to copy the music to cassette and then listen repeatedly to each bit, using your ear and your brain to work out what is happening. You would also need a piano or a guitar handy to check out which note is which. Transcribe! effectively replaces the cassette machine and the piano. Transcribe! offers many features aimed at making the transcription job smoother and easier, including the ability to slow down the music without changing its pitch, and to analyse chords and show you what notes are present. Posted by CC on Wed, 04/27/2011 - 02:16. Will this program provide the notes a singer is singing? And then allow me to transpose them to a different key? And provide the chords for a piece of music? Posted by Padraig Morrell on Mon, 06/04/2001 - 19:08. I am unable to open a file, even though it is saved as a WAV file. Message appears as no sound file found. Posted by Andy Robinson on Fri, 08/10/2001 - 09:27. Posted by Christian Van der Haeghen on Tue, 03/27/2001 - 15:03. Can I use Transcribe! to convert Audio music into TablEdit Tabs ? I have Windows 98SE and Soundcard. Posted by Andy Robinson on Thu, 04/19/2001 - 15:14. Transcribe! can help you to work out the notes, but it does not produce tab output. Posted by John Kilyungu Katuli on Wed, 02/14/2001 - 16:06. I wish to know wheather this software can transcribe music of non-western cultures whose pitches don't follow the tempered scale. Posted by Andy Robinson on Fri, 02/16/2001 - 11:17. It is useful in transcribing any kind of music - try it, you get a month's free trial.